Looking for just the right space for your outdoor furniture? Old deck not big enough – or safe enough – for your growing family? Looking for some shade over your deck or patio? Wanting environmentally-controlled space to enjoy your great backyard from? Whatever your needs, whatever your reasons, you’ll find our design process tailored to working with you to understand how you want to live outdoors. 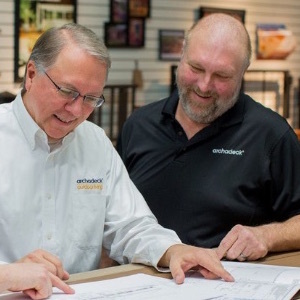 Our design process starts with a complimentary design consultation. No pressure. No obligation. These consultations are generally first held at your home/site where we’ll review your ideas, needs and concerns as we walk thru your project’s space. We’ll measure and photograph the areas of and around your project, assess some preliminary design ideas and discuss the Archadeck approach to designing and building your project. Our office and design center, located in Des Moines’ Urbandale suburb, also serves as an excellent site for this consultation. This approach is best facilitated by a pre-consultation site assessment where we’ll obtain pictures and measurements and have those readily available for the office consultation. Material displays, samples and other resources available at the design center can expedite the preliminary design process. Regardless of where this free consultation is held, the purpose is to determine a course of action for going forward with our design process that makes sense both for you and for us. What makes sense will be largely dependent on the outcome of our discussions and the complexities of your project and can take several paths. Our goal is to define which of those paths make sense and which we will pursue. Call us or complete our on-line “How Can We Help” consultation request form (at right) to schedule a time for your complimentary design consultation. Note that our office/design center is not “retail” and, as such, not always staffed. We are there a lot and we will accept walk-ins as appropriate or even to just browse if you’d like. But, to be safe, call ahead to ensure we can be attentive to your project interests. We look forward to hearing from you soon!